Reading and phonics worksheets, sight word practice, take-home books, and family reading games for beginning readers at Guided Reading Levels A-E! I knew I wanted to give my students and their families tools to facilitate at-home learning. So I developed homework packs that are designed specifically for students at a given guided reading level. 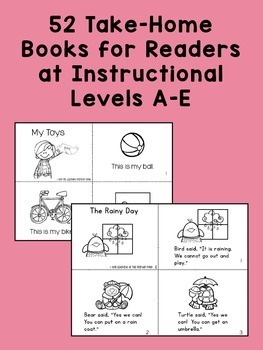 This bundle is perfect for beginning readers who are pre-readers or can read Level A, B, C, D, or E texts with support. The take-home books will empower your students to practice their beginning reading skills at home. 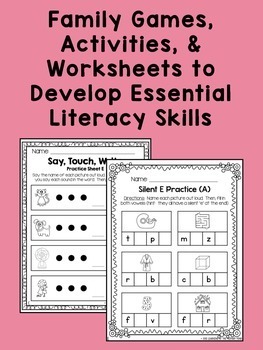 The accompanying games, activities, and worksheets will develop their phonemic awareness, phonics, sight word, handwriting, and writing skills. 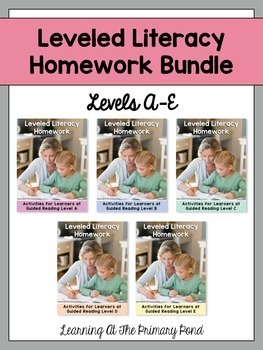 You can also purchase the materials in this pack separately: Level A, Level B, Level C, Level D, or Level E. Or, check out additional bundle options with levels A-B, A-C, or A-D. You can also purchase just the take-home books, or a set of family literacy games.